I have been meaning to share my own trip report from our April vacation for a while now. There's no time like the present, so here it is. 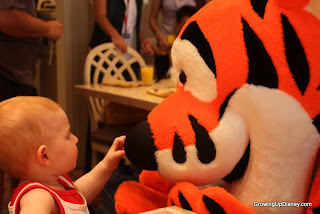 This was written while we were at Walt Disney World and appeared in Audrey's personal blog that we use to keep family updated. On Sunday, we got up super early and headed to the airport. Audrey did well on the flight to Houston, but it is difficult to hold a curious, active, social little girl in your lap for an extended period of time. She napped in her stroller in the Houston airport while we pushed her up and down the terminal. The airline seat fairies smiled upon us for the flight to Orlando and we managed to have an empty seat in our row which allowed the little one to squirm with more freedom. Granddaddy picked us up at the airport in his new Mercedes (we've all had fun with the new car.) We splurged on DVC points this time and got a Grand Villa at Old Key West. It's two-stories, 3 bedrooms, 4 baths and fabulous. 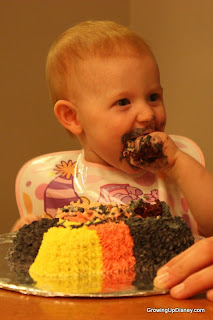 After dinner, Audrey got to dig in to a Mickey Mouse smash cake made by her grandparents. We all had fun watching her make a huge mess with the cake. Monday morning, Chris, Andy, Audrey and I bought park tickets and then took the ferry to the Magic Kingdom. Audrey's first time in the park was a quick one. We took a few pictures in front of the castle and left for brunch. Granny and Granddaddy were waiting on us at 1900 Park Fare at the Grand Floridian. It was chaos for the first little while, but overall we enjoyed our meal with Pooh, Tigger, Mary Poppins, Alice, and the Mad Hatter. We all wondered how Audrey would react to characters. Of course, she liked Mary Poppins and Alice and their pretty dresses. Thankfully she was also happy with Pooh and Tigger. The Mad Hatter was a different story and I was so glad he was last. He, just as a part of the character, is cantankerous and made Audrey cry. A monorail ride later and we were back at the Magic Kingdom. We took some cute photos on Main Street including some great ones with Audrey walking down the street with Granddaddy. Her first ride was "it's a small world." She seemed really interested in all of the dolls but poor thing was so tired that she was asleep by the end. Audrey tried pineapple Dole Whip but preferred the vanilla ice cream. That evening, Andy and I went to Jiko at Animal Kingdom Lodge to celebrate our 5th wedding anniversary. We had a wonderful meal. Tuesday was full of firsts. Audrey's first trip to Epcot, first french fry, first lemonade, first time to really use a regular straw, first time to color and play with crayons. 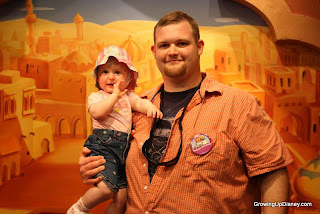 When we arrived at Epcot, it was about nap time so Andy and I strolled Audrey around World Showcase. We enjoyed the walk while she slept. We met the whole gang at Rose and Crown for lunch. Audrey didn't want to sit still so Granddaddy and I took turns walking with her. She had great fun trying fish and chips and feeding some to Granddaddy and Granny. 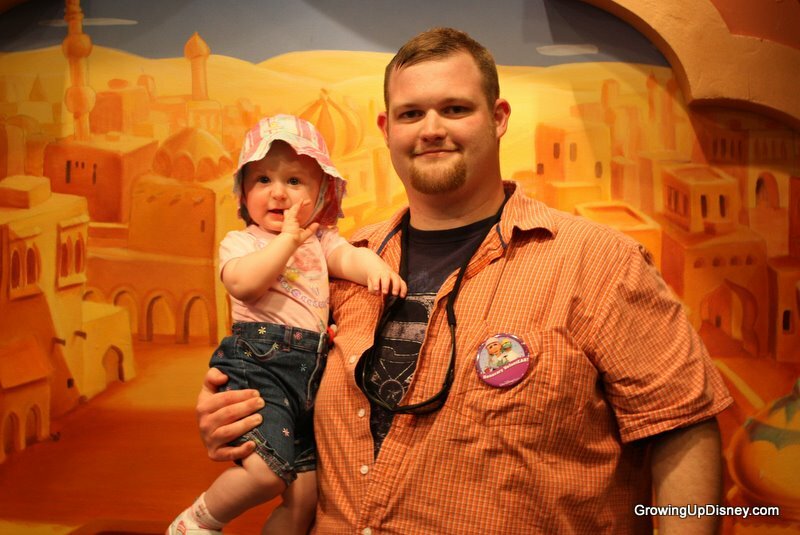 Uncle Chris took the lead on a project to have a birthday card card signed for Audrey in all the languages of World Showcase. Almost all the signatures ended up coming from pretty girls...imagine that. The card turned out really cool and we had fun exploring the pavillions. Granny and Granddaddy took Audrey to dinner at Olivia's at Old Key West and she had the whole restaurant wrapped around her very small little finger. She makes people light up--her red hair and big smile always attract attention. Andy, Chris and I came back to the villa with Mickey ice cream bars for everyone. Audrey shared mine and ate it like she'd done that dozens of times. The little one went right to sleep after her big day. Tomorrow is the big first birthday! The next part of the adventure is coming soon. Alot of firsts for that little girl!! How cute! Thanks Ladies! It was quite a trip!